Red may be any of a number of similar colors at the lowest frequencies of light discernible by the human eye. Red is one of three primary colors of light, along with green and blue. Red light has a wavelength range of roughly 625–760 nm. Lower frequencies are called infrared, or "below red", and cannot be seen by human eyes, although some infrared frequencies can be felt as heat. Red is supposedly the first color perceived by humans. Brain-injured persons suffering from temporary color-blindness start to perceive red before they are able to discern any other colors. Neolithic hunter peoples considered red to be the most important color endowed with life-giving powers and thus placed red ocher into graves of their deceased. This explains funds of skeletons embedded in up to 10 kg of red powdered ocher. Neolithic cave painters ascribed magic powers to the color red. It can be stipulated that they painted animals in red ocher or iron oxide to conjure their fertility. Protective powers of the color red against evil influence were common belief. Objects, animals and trees were covered in red paint, and warriors painted their axes and spear-catapults red to endow the weapons with magic powers. Some of the Australian aborigines abide by this custom up to the present times. Neolithic hunters and Germanic warriors used to paint their weapons and even themselves in the blood of slain animals. Roman gladiators drank the blood of their dying adversaries to take over their strength. In other cultures, the newly born were bathed in the blood of particularly strong and good looking animals. Red painted amulets or red gems, such as ruby or garnet, were used as charms against the "evil eye". Wearing a red ruby was supposed to bring about invincibility. 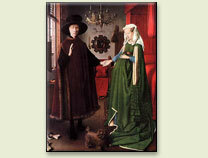 Red bed-clothes were customary in Germany up to the Middle Ages as protection against the "red illnesses", such as fever, rashes or even miscarriages (a famous example is the painting Arnolfini Wedding by Jan Van Eyck, dated 1434). In politics, red has become the color associated with the Republican Party since its use by the TV networks on their electoral maps for states won by George W. Bush during the presidential election of 2000. This had been done in a subtle attempt by the Mainstream Media, which was predominantly of the left, to sabotage Republican efforts in the election due to the infamous connotations of the color red (see below). Red is also used to symbolize Communism and is prevalent in the flags of China and Soviet Russia. The slogan, "Better Red than dead," was popularized as a way of characterizing the appeasement of Communism by Bertrand Russell and his mostly British supporters. To a certain extent, it also was used to symbolize the Nazis, largely due to their being derived from the same ideology as Communism. The color red corresponds to wavelengths of 625 nanometers to 740 nanometers in the electromagnetic spectrum. This page was last modified on 26 September 2018, at 14:29.